“Jangly” is a complimentary adjective in my music lexicon. It's a descriptor applied quite often to indie rock bands of the early '90s: think classic-era music from UK label 4AD. 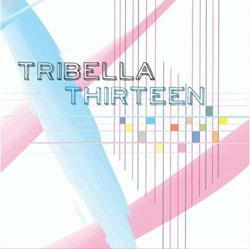 In the case of Texas trio Tribella, jangly serves as both a term of endearment as well as a nod to their forebearers. These darlings of the Austin music scene produce edgy ethereal power pop, showcased in fine form on their debut full-length album Thirteen. Released on the heels of the six-song EP My Guest List, and following the band's 2009 U.S. tour, Tribella's Thirteen is an ambitious collection, featuring nine (highly) original songs and one remix. Tribella has three members: lyricist, guitarist and lead vocalist Sarah Glynn, bassist Rae Golding, and drummer/vocalist Dena Gerbrecht. They've kept good live company, sharing stages with such artists as San Antonio trio Girl in a Coma and music festival mainstay Sarah Bettens (K's Choice). The group dips its toes into pseudo-Britpop, indie rock, prog, shoegaze, and even math rock. The result is a gleaming multifaceted expanse, leaping joyously from rhythm to rhythm–often within the same song–while still achieving a constancy of sound that successfully unifies the album. Previously released EP lead track “My Guest List” also features prominently on Thirteen, both in its original form and as a tinkling, yet somewhat tepid, remix courtesy of Eric LeRoc. There's a sassy defiant charm to its chorus: “And all the world that matters/Will be on my guest list/And all my friends that matter/Will be on my guest list.” It seems to be at once mocking such a shallow mentality, while at the same time celebrating the truly important things in our own little microcosms by bestowing upon them the honor of VIP status. For me, Tribella's sound is so familiar that it's difficult to critique. I just... like it. I delight in their use of irregular meters (highlighted with the title song, which is played in 13/8 time), their cynical-sweet lyrics, and most of all, Glynn and Gerbrecht's dense harmonies. If your heart doesn't beat to the rhythms of groups like Belly, Throwing Muses, Lush, or Metric, then Tribella might not be your cup of tea. Not everyone cottons to the complex flavors of genre-defying rock. But do me a favor: give it a teensy taste. Please? You never know. You just might like it.